The popular Grace Company motto, “We provide the tools, you create the masterpiece” rings true for quilters when commenting online about user friendly machine quilting frames. For example, today’s clever quilter needs all sorts of frames to help them create projects that require a good foundation and tools to get the job done. Grace frames are credited with having all the bells and whistles to compliment the hand or machine sewing process. For instance, Grace quilting frames feature easy to adjust rails for both needed height and adjustments. At the same time, the Grace Company “Fabri-Fast” frame quilting system is featured in all of the company’s rails. The manufacturer notes that its machine quilting frames allow the quilter to have more freedom during the creation of quilts. Quilting system that frees one from needing the usual quilting ties, tape or tacks. A true user friendly system for sliding fabric into the quilting machine rail slot to secure it without worry. Frames that are credited with having a fluid and really smooth “feel” when working on a creation. Frames made with solid metal construction and really smooth gliding on its quality and proven plastic track that never lets a quilter down. Frames designed for accurate movement and perfect for precise work with tools for intricate stitching on small or large stitching surfaces. Various clamps and slots that allow for all types of quilting work styles via the manufacturer’s many additional quilting notions or accessories that make this process really fun and enjoyable. In general, The Grace Company is the gold standard for creating high quality machine quilting frames that are priced reasonably and backed up with great product support, warranties and customer service. At a time when many quilters are looking for a high quality quilting frame for either machine process or to help hand quilters with their creations, Grace Company frames meet the need with high customer ratings. For instance, a longtime quilter explained online that without a good machine quilting frame that features such things as height adjustable rails or legs, “one’s job is much more difficult.” The quilter said she needed fame for hand quilting that is easy to examine when working on various layers of her quilt creation. Meanwhile, Grace Company features a “no-baste, no-fuss” system that includes aluminum rails featuring precision ratchets that translates to a quilter being able to use the best machine tools to get just the right amount of tension. In turn, hand quilters say they appreciate such things as easy fabric attachments, the unique Grace Company “flip-up rail” and other adjustable features that make quality with this frame very successful. The machine quilting frames on offer from Grace Company are not only fun to use, but are considered to be very nice to look at as well. For example, both the Gracie King and Gracie Queen models include special rails for batting, stunningly lovely looking wood craft construction that says “high quality.” In addition, there is no worries about being able to move around a quilt creation because these high quality machine frames feature adjustable legs, leveling fee, strong rails for big quilts and specialized bungee clamps to keep one’s creation properly secured for detailed quilting. Machine quilting frames are not made alike. There are the gold standard Grace Company models, and there is everything else. However, one sets Grace Company apart is a true quality customer service support system that compliments the company’s top of the line quilting frames that are priced for every budget. The company’s online catalog and website offerings are impressive when it comes to a keen knowledge and understanding of what today’s modern quilters really need when talking true machine quilting frames that never let you down. 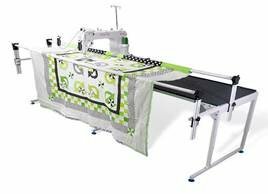 For instance, the company’s trending SR2 machine quilting frame offers any quilter a great looking and working machine at an affordable price. Overall, the modern quilter needs a machine quilting frame that compliments his or her unique quilting style and process. 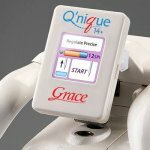 The Grace Company “gets” this fact, and is credited with designing its machine frames with the quilter in mind. The result is a family of Grace quilters who share their appreciation of these top of the line machine quilting frames with friends and family. The beautiful quilts produced with the aid of Grace Company machine quilting frames is the result.